Our paints are genuine solvent-based automotive paint. Water-Based paint: Earlier in the decade it became illegal to spray solvent-based paint in California. To comply with this law all touch-up professionals who sprayed or “airbrushed” damage had to switch to “water born” or “water-based” paints. These paints have no shine and do not hold up well to the elements unless a “clear coat” layer is added. Color matching was also an issue as water-based paints tend to change color as they dry. Also, you don’t see the true color until the final step of adding clear coat is attempted. While I applaud the adaptability of my peers it has forced them to buy more expensive equipment, apply more product, add much more time to each job and raise their prices considerably. Also, if a mistake is made, such as the color or sparkle being a little off, many won’t realize until the job is nearly done (when adding the clear) and, in fear of doing double the work at the same price, may decide not to attempt to correct it. Solvent-Based paint: Because we do not spray our paint we are free to use solvent based product. The weather will never effect it, color will not change as it dries, it will always be shiny and it is permanent. Over time, the sun bleaches certain hues out of the color your paint. This happens with all colors including whites and silvers. For this reason matching by color-code is not ideal. It will get you close but you may still have to modify it by eye to get a good color. The guys who have paint mixing machines work on older vehicles less frequently because they have to charge more to make up for the cost of their equipment’s purchase, maintenance, calibrations and in many cases, finance charges. Not many people want to spend a lot of money on an older car. They may not be as experienced with color matching by eye and in turn find difficulty in it. We do not utilize matching machines. All of our color is matched by eye. That’s not to say we don’t get stumped on occasion. 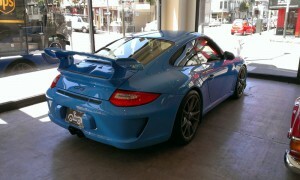 If we find it difficult to match the color of your car we do have access to colors by code. The color-code will get us close and then we can modify from there. Note: The car below is the only car we’ve ever had to match starting with a color-code in the history of the company and even it still needed modification. It’s just so bright but boy was it worth it!